On Thursday, May 23, 2013, the city of Takoma Park will screen the film of the folkloric ballet, Haft Paykar: Seven Beauties, performed by Silk Road Dance Company. Created by Takoma Park resident. Laurel Victoria Gray, this dance concert features choreography and costuming inspired by seven different Eastern cultures. Gray’s work is based on Nizami Ganjavi’s poem Haft Paykar (“seven beauties”) is remembered as one of the great narrative epics of medieval Middle Eastern culture. Although Nizami lived in the city of Ganj – located in present day Azerbaijan – he wrote in Persian, the court language of the day. Haft Paykar is a meditation on the beauty of diversity and humanity’s constant quest for perfection. The story is a simple one — a young Sassanian prince, Bahrām Gur, discovers a locked room in a Yemeni castle where he has been sent for his upbringing.. Opening it, he finds the walls adorned with the portraits of seven beautiful princesses from distant lands; he immediately falls in love with all of them. Each princess comes from a different country and is associated with a specific color, virtue, planet and day of the week. After a time, Bahrām’s father dies and Bahrām becomes the King of Persia. Upon assuming his throne, he sends for all of seven princesses, intending to marry each of them. He instructs his architect to build each princess her own “dome” – a residence decorated in her signature color scheme and aligned with her particular planet. The king visits a different princess each day of the week — for example, on Saturday he visits the Indian princess who lives in the Black Dome, on Sunday the Rûm princess of the Yellow Dome, and so on. Each princess regales Bahrām with a story that illustrates the virtue she must impart to the king.. From these stories, Bahrām gains wisdom and self-mastery of different aspects of his character. While Haft Paykar is an allegory about the necessity, and enlightenmen, that comes from diversity, but 12th century style, when you don’t befriend the “other,” you marry them. The epic poem is also a love letter to the wisdom of women. Bahrām Gur would not have become a great king without the uplifting, inspiring, and moral lessons taught by the princesses. His quest for human perfection is nurtured by the wisdom in their instructive tales. By listening and learning, Bahrām Gur reaches his full potential. Experience the beauty and the poetry of Haft Paykar at the free screening on Thursday, May 23rd at 7:30 PM at the Takoma Park Auditorium 7500 Maple Avenue in Takoma Park, Maryland. Presented as a “red carpet” event, the film premiere will give guests a chance to meet the dancers and the choreographer. Everyone is encouraged to dress up for the “royal” occasion. 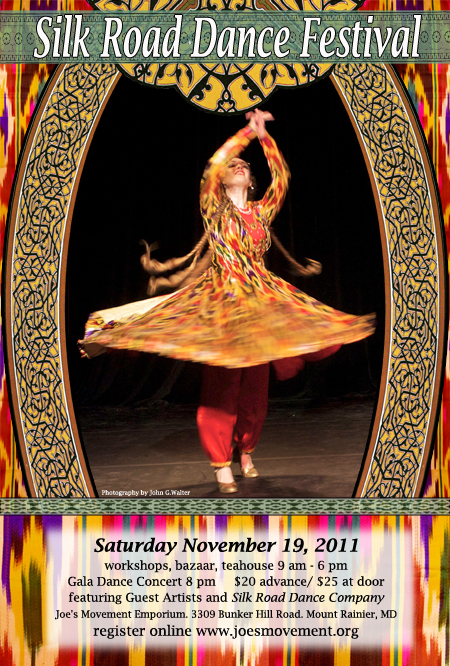 Announcing…Silk Road Dance Festival 2011! Inspired by the 2002 Smithsonian Silk Road Festival, this event celebrates the color and excitment of traditional dances of Silk Road cultures. Workshops begin at 9 am and include Uzbek and Kathak dance. A bazaar and an Uzbek teahouse – “Chaikhona” – will recreate the colors and flavors of the East. A gala evening concert beginning at 8 pm will feature the award-winning Silk Road Dance company and special international guest artists from China, India, Tajikistan, and Uzbekistan.